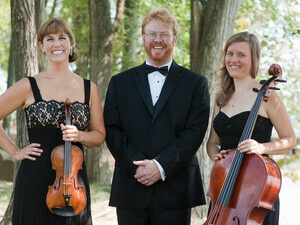 Frostburg State University’s Department of Music will present a concert by the West Shore Trio on Friday, April 8, at 7:30 p.m. in the Pealer Recital Hall of FSU’s Performing Arts Center. This event is free and open to the public. The concert will include Johannes Brahms’ “Piano Trio No. 1 in B Major, Op. 8,” Maurice Ravel’s “Piano Trio in A minor” and Ruby Fulton’s “Whitney, for Piano Trio,” a score commissioned by the West Shore Trio. The West Shore Trio is composed of Heather Haughn on violin, Diana Flesner on cello and Jay DeWire on piano. Jay DeWire is also a professor of music at FSU. Since their first performance on the west shore of the Chesapeake Bay, the West Shore Trio has brought passion, color and penetrating insight to the works they perform, not only through their playing but also through their commentary and interaction with audiences. Trio members accompany each concert with brief verbal commentary, providing biographical details about the composer, framing the work in context of its time, and highlighting thematic and compositional elements of the piece, as well as connections shared between each work on the program. They use accessible, jargon-free language that enables the music to be understood by non-musicians and musicians alike.